Let’s clear something up right away – contrary to popular belief, the avocado is a fruit. The green color of avocados, and their lack of sweetness, can trick you into thinking they’re vegetables; however, not only is an avocado a fruit, it’s a berry. Call it what you may, however, avocados are incredibly healthy and wonderfully versatile and, if you’re unfamiliar with this amazing fruit, it’s time to be introduced. Henry Perrine, a horticulturist, first planted avocados in Florida in the 1830, although they didn’t become a commercial crop until 70 or 80 years later. While they were widely eaten in Florida, California and Hawaii, where they were grown, the rest of the country was ambivalent about the green fruit and the avocado didn’t start gaining country-wide popularity until the 1950s and ‘60s. By the 1990s, though, the California Avocado Commission had succeeded in spreading the word about the avocado’s nutritional value via TV commercials, convincing Americans that avocado-based guacamole was the perfect food for snacking at sporting events or while watching the game at home, leading sports-crazed Americans to embrace the avocado in all its incarnations. 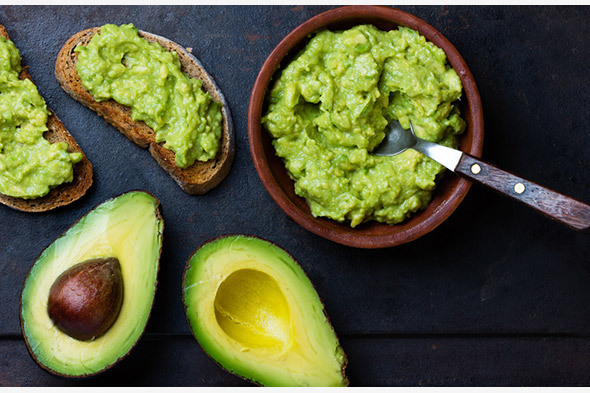 Today, Americans consume over 80 million pounds of avocados per year, mainly in the form of guacamole, the dip that contains mashed avocados, a fair amount of salt, and anything else you have on hand. There are about 400 varieties of avocado available around the world and it is considered one of the most nutritious fruits around. 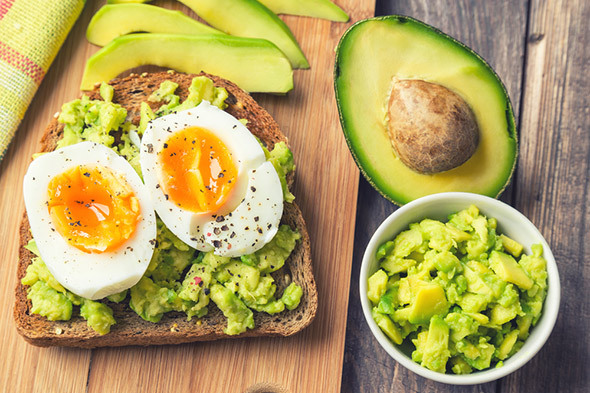 Avocados have very high fiber content, they are packed with potassium, folates and vitamin E, and they are one of the fruits with the highest protein content. One avocado has between 700 and 900 milligrams of potassium, while a banana, well-known for its rich potassium content, delivers just half that. One avocado packs four grams of protein, among the highest amount coming from a fruit, along with 18 important amino acids. 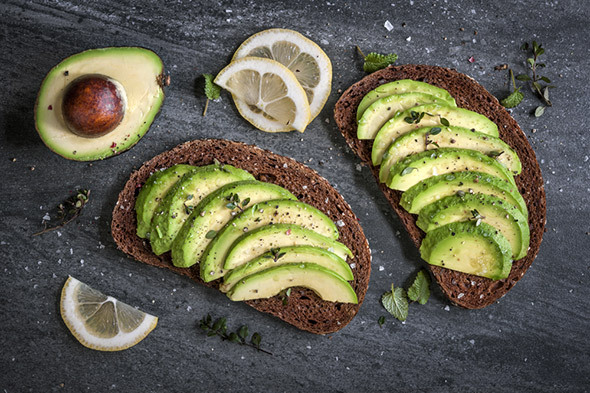 According to the U.S. Department of Agriculture, one serving (about a quarter of an avocado) contains about 65 calories, 6 grams of fat, 3.5 grams of carbohydrate, and less than a gram of sugar. Avocados are also a great source of vitamins C, E, K, and B-6, as well as riboflavin, niacin, and magnesium. Vitamin K is instrumental in maintaining healthy bones. Most of the calories in an avocado come from fat, but it’s the type of fat that’s considered healthy and beneficial. Eating healthy fats supports skin health, enhances the absorption of fat-soluble vitamins, minerals, and other nutrients, and may even help boost the immune system. Avocados are heart healthy: they contain a natural plant sterol called beta-sitosterol, which helps to maintain healthy cholesterol levels. They also contain two phytochemicals – lutein and zeaxanthin – that are concentrated in the tissues in the eyes where they help minimize damage, including from ultraviolet light. Unlike most other fruits, avocados do not ripen on the tree; instead, they soften and become edible only after they are harvested. Generally, a “good” avocado can be identified simply by noting the color of the fruit’s skin. In the case of the well-known Hass avocado, you should look for a dark purple, almost black, skin tone. Still, the best way to find an avocado that is ready to consume is by gently squeezing it. If you are able to lightly indent it with your fingertips, then it is probably ripe. In a fix, when you need to use your avocado ASAP, yet your store only has bright-green avocados that are hard and unyielding, you can speed along the softening process. Place your unripe avocado in a paper bag that has no holes and fold it tightly shut. The bag will trap the ethylene gas that is released from the fruit, ripening the avocado at a faster pace. In addition, according to The Hass Avocado Board, adding bananas or apples to the bag will cause even more ethylene to be released, allowing for even faster ripening. To open a ripe avocado, gently cut lengthwise around the fruit cutting it in half. Ensure that your knife fully makes it to the pit in the center. To remove the pit, firmly insert a knife into the pit; once the knife is embedded, twist to release the pit from the avocado, and slide the pit from the blade. For guacamole and many other avocado recipes, you can simply scoop the avocado meat out of the skin. However, if you want to leave the flesh well formed – for instance if you’re going to use intact slivers for a salad – you will have to carefully remove the skin. Using a small paring knife or a vegetable peeler, peel the skin away from the flesh, making sure not to leave any remnants of the rind. Because avocados contain the enzyme polyphenol oxidase, which quickly becomes oxidized, fresh avocado tends to turn brown and unappetizing-looking when exposed to the air. To prevent this from happening there are a few options. You can rub the exposed avocado with lemon juice; try keeping the pit in contact with the avocado; or add a bit of water to the container in which you are storing your avocado. Ideally, however, use fresh avocado as soon as possible to retain the fresh green color. A few years ago, avocado toast became all the rage when actress Gwyneth Paltrow included a recipe for it in her cookbook, It’s All Good. At the time, it became so Instagrammable that #avocadotoast had hundreds of thousands of posts. Avocado toast is nothing more than avocado – mashed, sliced or mixed with other ingredients – layered on toasted whole-grain bread. It’s healthy and vegan and it took the world by storm. It was the breakfast of choice for health-conscious millennials on the run, though the trend seems to have slowed down. Avocados are a great way to lower calories in baked goods when substituted for butter. When you bake, substitute half the amount of butter in your recipe for mashed avocado. This will not only lower the calorie content, but also yield a softer, chewier final product, where the taste of avocado is not noticeable. When using avocado in lieu of butter, lower your oven temperature by 25 percent and increase your baking time. This will help to prevent your cake from rising in the middle or, alternatively, caving in. It’ll also prevent the cake from browning too quickly. The avocado is a unique type of fruit. Most fruits consist mostly of carbohydrate, while avocado is high in healthy fats. Studies have shown that avocados have numerous beneficial effects on our health. 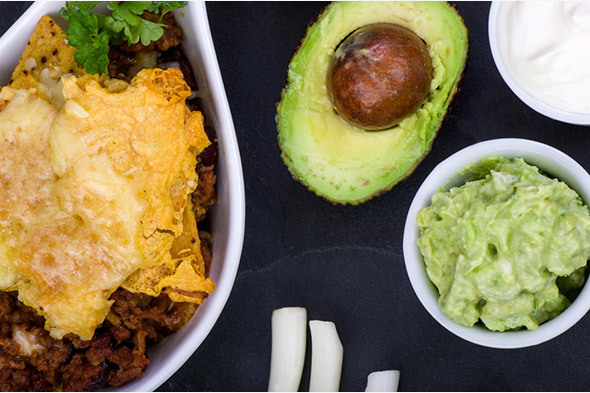 However, despite these benefits, the popularity of the avocado can be attributed mostly to its rich, creamy, velvety texture and its mild flavor that allows the fruit to be used in so many ways. Enjoy your avocado baked into muffins, mashed in guacamole, or straight up in salad; in any shape or form avocados really are a super fruit. This entry was posted in Cooking Tips, Food Guides, Health and Safety and tagged fruit, health, healthy, healthy food. Bookmark the permalink.